The weekly EIA working gas in storage report showed a 23 Bcf decrease to 3.814 Tcf. The current level is 23 Bcf (-0.6%) lower than last year's storage level and 347 Bcf (+10.0%) higher than the five year average. The weekly withdrawal was far better than last year (a 2 Bcf injection) but not as good as the five year average (36 Bcf withdrawal). The weekly changes reflected regional temperatures, which were 1.7 degrees warmer than normal but 3.0 degrees cooler than last year. Temperatures in the East Region, which has the largest storage capacity and usually drives the withdrawals in the cold months, were actually warmer than normal last week. 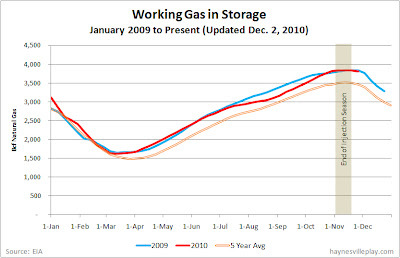 Storage across the Producing Region actually increased for the week.